August 9, 2012 - The National Transportation Safety Board continues its investigation of the July 28, 2012 contained engine failure that occurred on a Boeing 787 Dreamliner during a pre-delivery taxi test in Charleston, South Carolina. A contained engine failure is a specific engine design feature in which components might separate inside the engine but either remains within the engine's cases or exit the engine through the tail pipe. This design feature generally does not pose immediate safety risks. The General Electric GEnx (General Electric Next-generation) is an advanced dual rotor, axial flow, high-bypass turbofan jet engine in production by GE Aviation for the Boeing 787 and 747-8. The GEnx has replaced the CF6 in GE's product line. Last week, the NTSB sent an investigator to the scene to gather information on the incident and subsequently launched a full investigation into the cause of the failure, led by NTSB Investigator-in-Charge, Mr. David Helson. On August 1, 2012, a team of experts from the NTSB, FAA, Boeing and GE Aviation specializing in engine systems and metallurgy traveled to a GE facility in Cincinnati, OH to disassemble and examine the failed GEnx engine. GE is the manufacturer of the GEnx engine. The parties to the investigation have been extremely cooperative in assisting NTSB personnel in its review and assessment. As a result of the investigative work to date, the NTSB has determined that a fan mid-shaft on the failed GEnx engine fractured at the forward end of the shaft, rear of the threads where the retaining nut is installed. The fan mid-shaft is undergoing several detailed examinations including dimensional and metallurgical inspections. 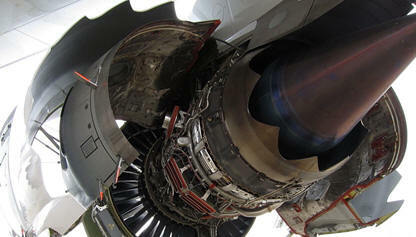 The GEnx engine is a newly designed aircraft engine. It is a "dual shaft" engine, meaning that one shaft connects the compressor spool at one end to the high pressure turbine spool at the other end. A longer "fan shaft" connects the fan and booster in the front of the engine to the low pressure turbine in the back. The cockpit voice recorder and flight data recorder, which is a combined unit on the 787 Dreamliner, was transported to the agency's Recorders Laboratory in Washington, DC for processing and readout. Both recordings captured the event and analysis is ongoing. Moving forward, investigators will continue the detailed examination of the engine and metallurgical analysis of its components. The investigators have also begun reviewing the engine manufacturing and assembly records.